Democratic voters in Chittenden County will vote in a rare contested primary for probate judge on August 14: Incumbent Gregory Glennon faces a challenge by lawyer and former Winooski mayor Bill Norful. Glennon is not taking the opposition lightly. By the July 15 campaign finance reporting deadline, he had raised $7,500 from 76 donors. That's more money than reported by any of the 16 other probate judge candidates in counties across the state. Glennon is also the only one of the bunch who reported receiving cash from attorneys whose cases he will decide — an issue that sparked a testy exchange with his opponent during a televised forum last week. At stake is a four-year term as the county's $125,000-a-year probate judge, handling adoptions, estates and wills, name changes, and guardianships. There is no declared Republican candidate, but the county GOP committee can nominate someone after the primary. Glennon's fundraising and the fact that he has an opponent are both unusual, according to Dan Richardson, a Montpelier attorney and former president of the Vermont Bar Association. Most candidates self-fund or don't spend any money at all. Richardson said he's never known an incumbent probate judge to face an opponent. "I don't think many people go to the polls because of a big interest in a probate judge race," he said. Certainly not in the last two decades in Chittenden County. Susan Fowler, Glennon's predecessor, was elected in 1994 and ran uncontested in six elections over 22 years. When she retired in 2016, midway through her term, then-governor Peter Shumlin appointed Glennon, who was general counsel to the state Agency of Education. The judge is married to the sister of Vermont Attorney General T.J. Donovan, who said he advocated for Glennon's appointment. As candidates for a judgeship, Glennon and Norful are subject to a stricter set of campaign rules than contenders for legislative or executive office. Judges cannot "personally solicit publicly stated support" or donations, according to the state's judicial code of conduct. Instead, candidates must create a committee to do it for them. Contributions are capped at $150 per person. Glennon said his committee asks for money and authorizes all expenditures. A number of donations have come from lawyers who have cases in Glennon's court. For example, Norm Blais, a $150 donor and head of Glennon's campaign committee, is scheduled to appear in Chittenden Probate Court three times this month. The act of electing judges "inherently creates a situation that's somewhat awkward," Blais acknowledged, but added, "The Vermont Supreme Court has set out a pretty distinct set of rules, and I know we're following it." Mark Langan, of the firm Dinse, gave $150; he appears in Glennon's courtroom about once a month, he said. He gave after receiving a mailing from Glennon's committee. The judge "does a good job," Langan said, adding that he isn't familiar with Norful. Langan said he read the ethics rules before donating and decided he was in the clear. "It's too small an amount" to affect Glennon's impartiality, he said. Jeff Wick, a partner at Wick & Maddocks, gave $150; in September he will represent a client in an estate case before Glennon. Wick wrote in an email to Seven Days that he does a "fair amount of probate work." "In my experience, Judge Glennon runs the probate court efficiently and competently, and he treats all who appear before him with respect and dignity," he continued. Asked whether such a donation could constitute a conflict of interest, Wick suggested that Seven Days was engaging in "gotcha journalism." "It is very well established that lawyers may make campaign contributions to candidates for the office of probate judge, even if the giving attorney is a probate lawyer," he said. Attorney Ben Luna and the law firm Unsworth LaPlante, where Stephen Unsworth is a partner, also donated to Glennon. Luna and Unsworth had argued cases in his court within the last six months. Glennon emphasized that he played no role in deciding whom to ask for money and that supporters are limited to small donations. He noted that he is required to announce in court whether an attorney involved in a case before him has donated to his campaign. In a contested hearing, which is rare, a lawyer can request that a different judge preside. "Believe me, I'm not for sale," Glennon said. It's not just corruption but the appearance of corruption that's at stake, said Peter Teachout, a professor of constitutional law at Vermont Law School. "It gives me a little pause; it certainly does," he said. "The minute you start to allow contributions in an election campaign, you have to worry about ... influence." 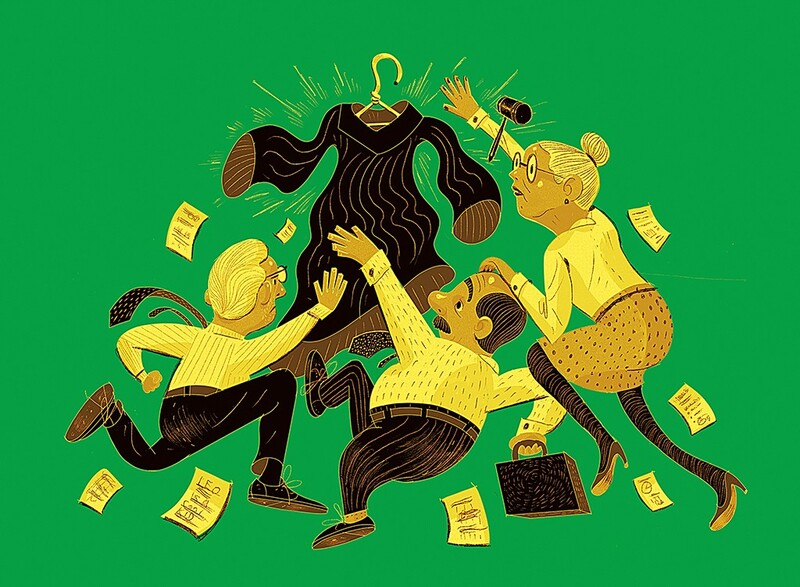 Judges who raise money from lawyers who appear before them can "undermine the independence of the courts," said Stephen Spaulding, an attorney with Common Cause, a Washington, D.C.-based nonprofit that works to improve government accountability and ethics. "Vermont has very low contribution limits to curb corruption and the appearance of corruption," he acknowledged, but said he advocates for public financing of elections. A $150 donation may not buy influence, Spaulding said, but "it's fair, I think, for people to question that it could." One of Glennon's $150 donations came from Jessica McCloud, Donovan's wife. And though the Vermont attorney general himself didn't donate any money, Donovan is an unabashed supporter of his brother-in-law. "We have a sign in our front yard," he said. "Bill Norful's a friend of mine, but Greg's family." Glennon said he hasn't taken advantage of his relationship with Vermont's most powerful lawyer on the campaign trail. "I'm standing on my own two feet, working as hard as I can to meet as many people as possible," he said. Norful, who practices family, criminal and probate law, declined to comment in an interview on Glennon's fundraising but took his opponent to task in a Channel 17 debate last week. He called it "unethical" and "absolutely improper" for a judge's campaign committee to ask an attorney for cash, suggesting that any lawyer would feel obligated to donate if he or she had a case before the judge. "Call me Victorian, but I don't think it's appropriate. I haven't done that. I won't do that," Norful said vehemently. "That's a really outrageous statement for an attorney to make against a sitting judge," Glennon retorted. "It's untrue, and it's disgraceful." He said he's following the Vermont Supreme Court's rules "to the letter" and accused Norful of "unprofessional conduct." At a July candidate forum, Norful pitched his experience as a Winooski city councilor, four-term mayor and self-employed attorney. He has what it takes, he said, to help those trying to adopt a child or change their name to navigate judicial processes. "When people come into a room, whether it's city hall or a courtroom, they need to feel comfortable and welcome," he said, calling the courthouse the "people's hall." Norful said later his challenge of Glennon isn't personal; for years, he planned to run when Fowler retired. As of July 15, he had used nearly $6,000 of his own money to fund his run. Craig LaVigne, post quartermaster of the local Veterans of Foreign Wars chapter, said he'd grown up with Norful in Winooski — but that wasn't why he put up a lawn sign in support. "Knowing Billy, he'll put 110 percent into this," LaVigne said of the judgeship. Norful has plenty of experience as a lawyer, and "he's civic-minded here in Winooski, too," he added. Norful said he is trying to steer clear of the conflicts mentioned in the judges' ethics code. When Seven Days asked whether he had a campaign volunteer who would discuss the race, he hesitated, worrying that his answer might be considered "soliciting public support." "It's a funny business to run for office and yet be a judge," Norful said. 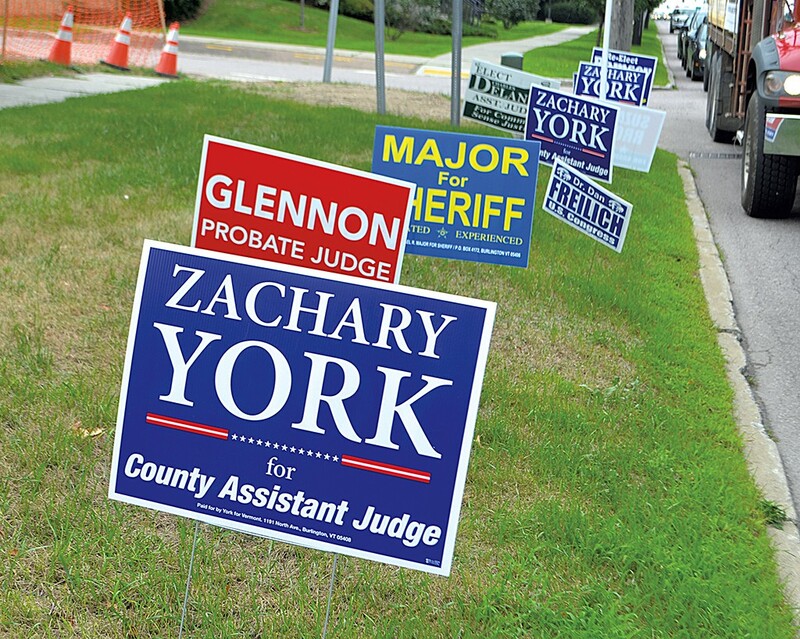 If the proliferation of yard signs decided political races, Zachary York would be a shoo-in for one of Chittenden County's two assistant judge — or side judge — positions. The 25-year-old Burlington resident and court clerk bought 300 signs and has lined them up by the dozens along busy roads. That's set off incumbent Connie Cain Ramsey, who has grown irritated with what she sees as York's excessive signage. "I put up one poster. He puts five around it. It's ridiculous," she fumed. York and Suzanne Brown of South Burlington are challenging Ramsey and her fellow incumbent, Charles Delaney, for the Democratic nomination for side judge on August 14. Delaney and York already received the Progressive nomination from the party's county committee, so even if they lose in the Democratic primary they will appear on the November ballot. No Republicans have announced a challenge. Side judges are elected to help a primary judge sort through the facts in family and civil cases. They also act as county administrators, preparing the $1.2 million county budget as well as overseeing the county courthouse and other county property. They serve four-year terms and are paid $29,812 a year plus roughly $21.78 per hour for their time in court. The contenders' first job, they said, has been to introduce themselves to an electorate largely ignorant of what side judges do. More than campaigning, it's been an "educational tour," York said. Brown put it more bluntly. "Most Vermonters have no idea about assistant judge and probate judge," she said. Brown is the only one of the contenders who has a law degree. Ramsey and Delaney said they are taking their challengers seriously. Compared to her previous two campaigns, in 2010 and 2014, "This one's just so crazy," Ramsey said. "Usually it's low-key." Delaney touted his success at keeping county spending in check. He and Ramsey balanced the budget by renting out the parking spaces behind the courthouse after hours, Delaney said. "We're trying to hold the line" on taxes, he noted. Under the fluorescent lights at a neighborhood planning assembly in Burlington's New North End in late July, the candidates all pitched themselves as uniquely qualified for the position. Delaney, who was trained as a mason, contended that he's the right man for the job because of his work advocating for Abenaki rights on the Vermont Commission on Native American Affairs. Ramsey described herself as a woman of the people: She's an eighth-generation Vermonter who has raised two kids and started a business in Burlington. York touted his work as a court administrator, working primarily in the building where, if elected, he'd sit on the bench. Brown did not attend, but she has run her own family law practice for 30 years, she told Seven Days later. Ramsey has contributed $1,500 to her own reelection effort. York has contributed his own money and received donations from his fiancée and Burlington City Councilor Jane Knodell (P-Central District). He's raised about $2,100, according to the July 15 campaign finance filings. Delaney and Brown did not file campaign reports, but both said they accepted no outside contributions. York made no apologies for his battalion of yard signs. Being a side judge is "such a great opportunity, I'd hate to not give it my all," he said. Correction August 8, 2018: A previous version of this story incorrectly reported the salary of the side judges.